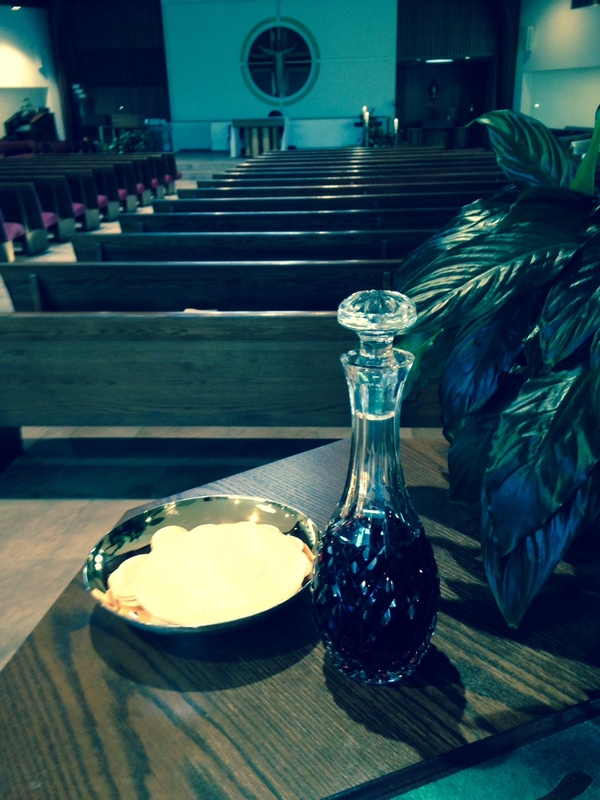 Last week we concluded the Easter season with the Feast of Pentecost, the coming of the Holy Spirit. Today we celebrate the Solemnity of the Holy Trinity, an appropriate conclusion to the liturgical time when God reveals himself as Father who created the world, as Son born of Mary, who suffered under Pontius Pilate, died and rose again, and as Holy Spirit come to complete the work of God among us. In the Solemnity of the Holy Trinity, we recall God’s revelation of himself–who he is– a “wondrous mystery” beyond our knowledge and expectation. Remember where belief in the Trinity comes from. It’s not made up by human being like ourselves; it’s not something arrived at by human speculation or human reason. Belief in the Trinity comes from God, who reveals himself to us as Father, Son and Holy Spirit. Read the psalms. You can hear the tender, intimate voice of God speaking to his people and revealing himself to them. In the next step of revelation, God reveals himself in Jesus Christ. “This is my beloved Son,” God says at the baptism of Jesus in the Jordan. “My Father and I are one,” Jesus says in the gospels. In Jesus God takes a human face, a human mind, a human heart, a human history. He speaks to us in human words and actions, in cries and tears and sufferings and death and a profound love. In Jesus’ resurrection God shows us the path to life. We have the promise of eternal life in him. The final revelation God makes is when he sends us the Holy Spirit. Jesus says the Spirit will teach us all truth. He will abide with us and gather all peoples from the ends of the earth to form one family of God. The Spirit will recreate the earth. Sometimes you hear people say that belief in the Trinity is not important. The Moslem world, for instance, holds that God is One, only One. Others say that this belief is too much to understand. Our belief in the Trinity is important. Why? Because God reveals himself to us this way. We may not understand it fully, but that’s because minds are limited and God is beyond what we can know. This belief is not something we thought up; it’s God telling us who he is. Yes, God is unknowable, but he calls us to know him. Yes, are words are inadequate, and yet we can put our belief in simple words and gestures. We can listen to God revealing himself in the scriptures and are blessed by God through this belief. This entry was posted in Religion and tagged Creator, God the Father, Holy Spirit, Jesus Christ, Trinity Sunday on May 30, 2015 by vhoagland. When you read St. Irenaeus, especially his Adversus Haereses, you have to remember he’s reacting against. the gnostics of the 2nd and 3rd century. Some scholars today want us to believe the ancient gnostics were broadminded, creative people–rather like themselves– who thought more progressively than the plodding, conservative people of the “great church”– as Irenaeus called it. In fact, the gnostics made the world smaller than it is. They did so by making much of the world evil; only some of it meant anything at all. Forget about the rest of it. All creation is God’s, Irenaeus replied. “With God, there is nothing without purpose, nothing without its meaning or reason.” Embrace it all. Our reading from the Book of Sirach at Mass today presents the same belief. He used the Eucharist as a sign of this. The bread and the wine we offer represent all creation. When we offer them to God, we thank him for all there is and embrace it in love as he does. These are no small gifts, though they seem so small. This is not common bread, it is not common wine. These signs encompass all. Through Jesus Christ, who became our high priest by becoming incarnate and therefore part of all creation, we offer these gifts to their Creator. Jesus takes them in his hands, he makes them his own, to offer them to his Father and our Father. You can see this belief represented in the prayers and rites of our Mass. They helped Ireneaus think about faith and about life. They can help us too. 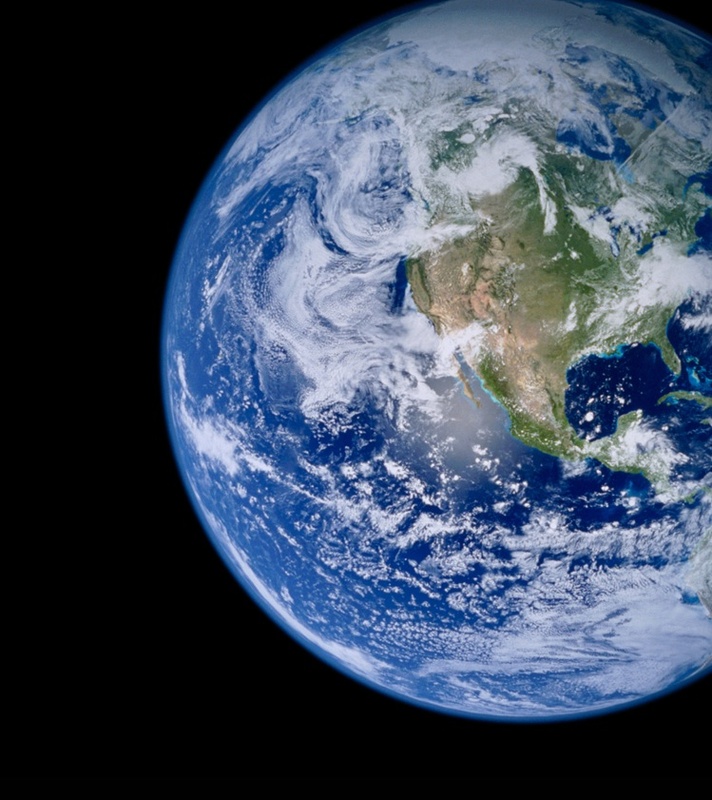 We live in a big world; we shouldn’t forget it, we should embrace it. This entry was posted in Religion and tagged Book of Sirach, bread and wine, Eucharist, gnostics, Irenaeus, Mass on May 28, 2015 by vhoagland. According to the Acts of the Apostles, the Holy Spirit dramatically appears to Jesus’ disciples on the Jewish feast of Pentecost, fifty days after Passover. (Acts 2,1-11) Originally Pentecost was a harvest feast celebrating the fruitfulness of creation, and so appropriately signs of creation come from the sky– fire, noise like a mighty wind– announcing the coming of the Holy Spirit who renews the face of the earth. By the time of Jesus, the Pentecost feast was also a celebration of the covenant made by God with Israel after the Passover. On this day, the Spirit offers God’s covenant to all peoples and promises to renew all creation. On the day of Pentecost, the disciples of Jesus immediately and confidently leave the upper room and preach the gospel to pilgrims gathered in Jerusalem from the ends of the earth for the feast. “Where did these Galileans get all this?” their hearers ask “as they hear them speaking in their own tongues of the mighty acts of God.” They’re the first to bring the message of Jesus to faraway peoples in Mesopotamia, Judea, Egypt, Rome. This was a remarkable event. On Pentecost as we participate in this feast we look for the graces to boldly and confidently bring the gospel to all peoples and to all creation through the Spirit given to us. The Holy Spirit came on Pentecost over 2,000 years ago. We can ask: Is its promise being fulfilled? Today, recent studies say there are over 6 billion people in our world, 2 billion of them are Christian– about one out of three. Christians are evenly dispersed through the world, studies say, and their numbers are growing in Sub Saharan Africa and the Asia Pacific regions. The Holy Spirit seems to be at work in our world. What’s quieter, simpler than that? He breathes the Spirit on them. He shows them the wounds in his hands and side, signs that everything that evil could do to him was done to him. Yet he conquers every evil, even death. The Spirit always comes through the wounds of Christ. The Spirit is at work in the darkness of our world. In our liturgy we have the same quiet promise of the Spirit. “Like the dewfall” the Spirit comes upon the bread and wine, signs of creation, and transforms them in the Body and Blood of Jesus Christ. The Spirit rests in the waters of Baptism, in the signs of the other sacraments, creating, healing, forgiving, bringing together a world that’s divided. The Holy Spirit is God’s everyday gift, and no day is without his sure, silent, powerful presence. Behind the Chair of St. Peter in the Vatican Basilica in Rome, the artist Bernini created a beautiful alabaster window where a steady light pours into the dark church through the image of the Holy Spirit, in the hovering form of a dove. Day by day, the light comes quietly through the window. Day by day, the Holy Spirit dispenses light for the moment, graces for the world that is now. As Jesus promised, the Holy Spirit dwells with us, his final gift. Come Father of the poor! This entry was posted in Religion on May 23, 2015 by vhoagland. You never know what the day will bring. 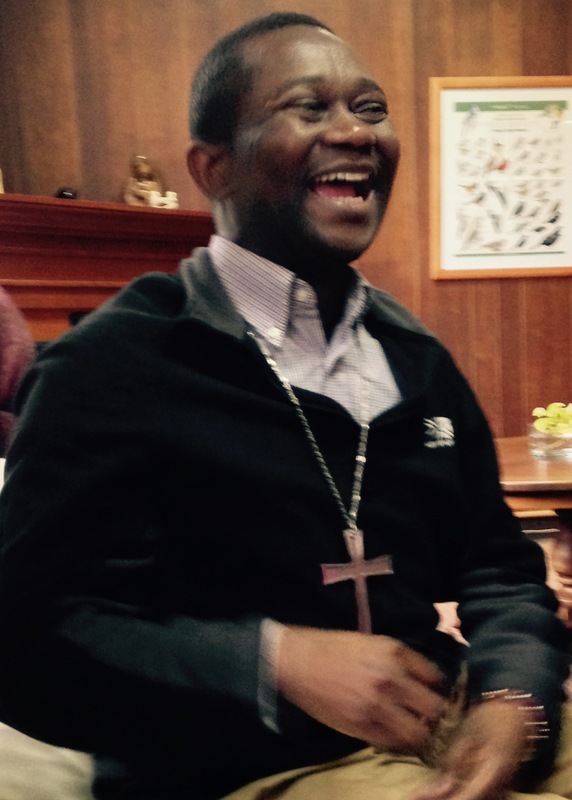 Father Emery Kibal is a Passionist priest from the Democratic Republic of Congo who’s staying with us this year here in Jamaica, New York and serving as chaplain at Mercy Hospital in Rockville Center, Long Island. A few weeks ago as he was coming down the hospital stairs his mobile phone rang. It was the Apostolic Delegate from the Congo. “Pope Francis wants you to be the bishop of the Diocese of Kole in the Democratic Republic of Congo.” “Can I have some time to think it over,” Father Emery said. “When Mary was asked by the angel to be the Mother of God, she answered immediately,” the Apostolic Delegate said. “What could I say to that?” Father Emery said afterwards. He will be ordained bishop in the Congo in July. You never know what the day will bring. The diocese Bishop Emery will lead faces hard times. Some months ago the Archbishop of Kinshaha in the Congo was visiting our community on his way to Washington to ask the American government to stop arms shipments to his country where armed bands are causing hardship and widespread disruption. Yet as you see, the new bishop laughs. In today’s readings for Mass, St.Paul says “ I do not shrink from proclaiming to you the entire plan of God.” He’s convinced the Spirit of God is his guide and support in the ministry God gives him. God bless you, Bishop Emery. This entry was posted in Religion and tagged arms dealers, Bishop Emery Kibal CP, Democratic Republic of Congo, Mercy Hospital, Passionists on May 19, 2015 by vhoagland. Some early sources describe the gospels as “ memoirs of the apostles.” The gospels are based on the memories of those who witnessed what Jesus said and did in the years they were with him, namely from when he was baptized by John in the Jordan River until the time of his death and resurrection. Their memories reveal their experience of Jesus. Those memories were redacted later and given a form by the evangelists Matthew, Mark, Luke and John and their communities, and in that final form come to us. But the gospels are still substantially the memories of the apostles and those who first followed Jesus. That’s good to keep in mind when we’re listening to the gospels – we have in them the memories of the apostles and those who were with Jesus. It helps us understand the writings of the New Testament better and, more importantly, it helps us to know and experience the One that they came to know and experience. It looks like we have in today’s reading from the Acts of the Apostles a memory of Peter about the choice of a replacement for Judas, the betrayer of Jesus, after the Lord’s resurrection. As Luke presents the story, Peter stands before a hundred or so followers of Jesus and quotes from the psalms, indicating that Judas has to be replaced. In Luke’s presentation, to tell you the truth, Peter sounds to me somewhat cold and official, like a judge in a court. But was he really so? What painful, hopeful memories he must have had when he spoke the name Judas“the one who guided those who arrested Jesus?” How could be not remember his own part that night when he and the rest of the disciples left him and fled in the Garden of Gethsemane. Yet, here they are, rebuilding their number again, not from their own power and goodness, but through the mercy and goodness of God, calling them anew to a mission far beyond what they could hope for or deserve. The way Judas’ successor is chosen is interesting too. He has to be “someone who was with us when we were with Jesus, from the baptism of John until the day he was taken up from us: he should be named as witness to his resurrection,” Peter says. Two are nominated, Joseph (called Barsabbas, also Justus) and Matthias. But instead of the group talking together, deliberating, voting about these choices, they do it by casting lots, flipping a coin. This is God’s choice, not theirs. It seems to me if we take this passage as a memory of Peter, we see a changed man and a changed disciples. 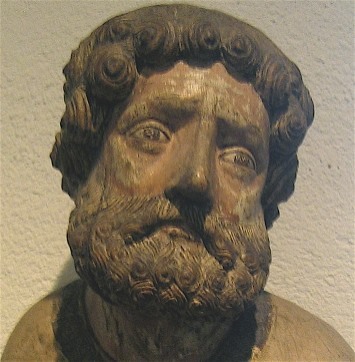 Peter, whom Jesus said earlier in the gospels looked at things as human beings do and not as God does, Peter whom Jesus called “Satan” at one point, who seems so sure of himself through most of the time he’s with Jesus, Peter recognizes that God is at work and defers to God’s plan and God’s will instead of his own. Going beyond the formality of this reading from the Acts of the Apostles, can’t we see a disciple transformed? I have a favorite picture of Peter, a medieval portrait that I saw years ago in the Cloisters in New York City. He’s not the strong, assured figure you often see portrayed by artists. This is Peter softened by experience, by failure and by the mercy and kindness of God. He’s not a know-it –all. He knows that God’s ways are mysterious and prays to know and do God’s will. And isn’t that what we all hope for–to learn in life that God is merciful and kind and to trust and hope in him. Suppose Peter someday came to the Mass we were celebrating and we asked what he remembered that night when he and the others ate with Jesus before he was arrested and put to death. I think he would say something like this: to us, “That night when we sat down to eat with him, Jesus told us one of us was going to betray him. We all asked who it was. No one of us could believe it. I said I would die rather than deny him. But I did deny him. Then he took bread and wine and said this is my body, this is my blood and he gave them to us to eat. He prayed for us and said he loved us and he would see us again. If you read the Last Supper account from the Gospel of Mark, which they says depends on the memories of Peter, you read something very much like that. This entry was posted in Religion on May 16, 2015 by vhoagland. Jesus did not just come out of the tomb; he ascended to heaven. He rose from the dead and disappeared from our sight to return to his Father and our Father, his God and our God. The mystery of his ascension completes the Paschal Mystery. In his victory over death we’re promised a life beyond this one. When I was a boy, I remember my father buying a record player. It was the mid 1940’s and times were hard; I’m sure he broke the family bank to pay for it. For a good while he only had a couple of those old vinyl records he would play over and over. “I got shoes, and you got shoes, all God’s children got shoes. and gonna walk all over God’s heaven, heaven. Everybody’s talking bout Heaven ain’t goin’ there. I still feel the hope in that great singer’s voice as she sang that song. She was singing the song of barefooted slaves who were looking for something more. It wasn’t just a pair of shoes that would wear out after awhile. These were shoes God gave you in heaven, a place of completed dreams. Once you put on those shoes you could walk freely and walk everywhere. The Feast of the Ascension describe heaven as our final home, where all our dreams are realized, where tears are wiped away, where sadness is no more, where wrongs are righted, where reunion with those we love takes place, where we enjoy the presence of God and all the saints. For now, we only have hints of heaven. We only have assurances of faith. However, it’s not enough to just talk about it, as the spiritual says, we must walk in the steps of Jesus. Walking in his steps brings us, not to a grave, but to the place where he is. That’s heaven. This entry was posted in Religion and tagged ascension, heaven, Jesus Christ, Marian Anderson, Passionists, shoes, Spirituals on May 15, 2015 by vhoagland. I was in the local Barnes and Noble Bookstore recently and in the religion section noticed a good number of books on heaven. Most of these, as far as I can judge, are accounts of people who say they’ve been there or just about and are reporting on their experience. Heaven’s an item of interest today. 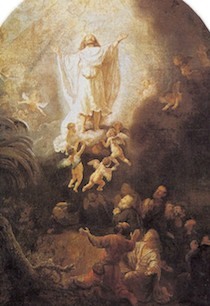 The Feast of the Ascension is our basic book on heaven. Look to Jesus Christ who promises us a home there. The Ascension is part of the Easter mystery. On Easter Sunday, Jesus rose from the dead and for forty days, the scriptures say, he ate and drank and met with his disciples to build up their faith. Then, he ascended into heaven. Rising from the dead was not the end of his story. He rose from the dead but did continue life on earth. He did not rise like those whom he himself raised from the dead, like Lazarus whom he called from the tomb and the little girl and the dead son of a widow of Naim. They went back to ordinary life. Jesus did not. No, after he rose from the dead, he ascended into heaven to sit at the right hand of the Father, our creed says. He entered another world beyond this one, a world greater than this one. There, from a place of great power, he extends his promise and power to us here on earth. Because he was to ascend, he told Mary Magdalene in the garden after rising, “Do not hold me, I must ascend to my father and your father.” Jesus had to ascend to heaven, to his home and ours. The mysterious way Jesus appeared to his disciples after his resurrection points to the impermanence of this life and the finality of a heavenly life. His risen appearances are brief; he appears in a veiled way. He appears to his disciples mainly to assure them that he lives and to give them the promise of life eternal. This entry was posted in Religion and tagged ascension, eternal rest, Feast of the Ascension, Lazarus, Resurrection of Jesus on May 14, 2015 by vhoagland.